In July, one of our techie superstars, Alison Kline-Kator, held a Mercy 2.0 Boot Camp for our new teachers and staff. This included three mornings of immersion in ways that technology currently does and soon will integrate with our curriculum. As an opening exercise, Alison divided her minions into small groups and rotated them around the room to brainstorm answers to general questions about technology and education and write then on big sheets of post up paper. 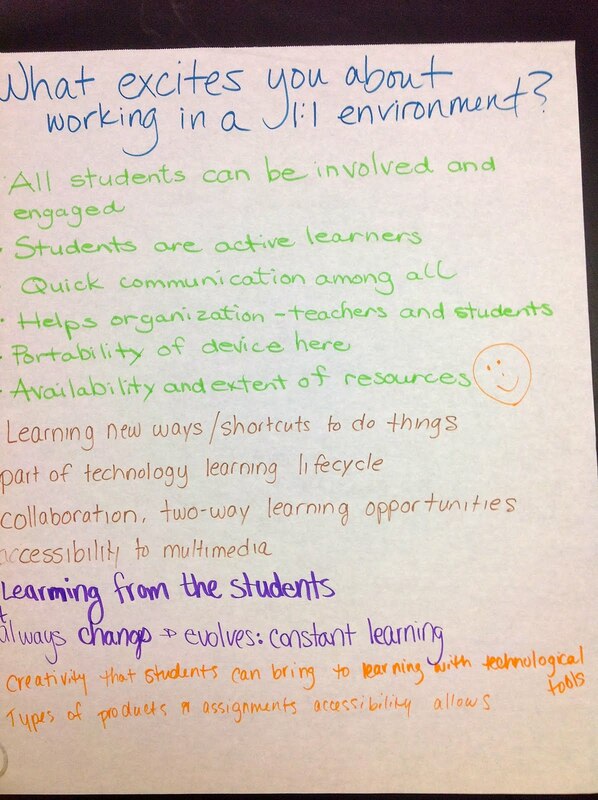 I was particular taken by the responses to What excites you about working in a 1:1 environment? *All students can be involved and engaged. *Portability of device [iPad] . . . .
*Availability and extent of resources. *Part of technology, learning life cycle. These struck me as “spot on” and assured me that we had some great new folks joining our ranks.